Is Double Deception coming to an end? The majority of the forum population have come in contact with someone's alternate account, also known as a double. Doubles are quite enjoyable in role play for their users and role play readers/participants. However, it's a common occurrence for double users to play the "guess me" game with their accounts. They enter the forums masquerading as someone knew or they bring their account to the forums and challenge it's investigators to discover their identity. 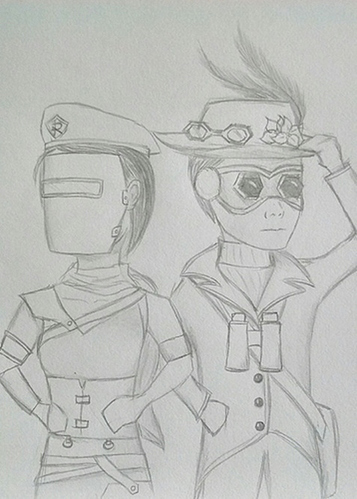 Other forumers, such as Ariella_Newheart and Alex_Ironquill1 , have kept their double's identity a secret. However, it proved more destructive then exciting. There are diverse opinions on how we might dissolve double deception while keeping the doubles themselves. There are two current opinions running. The first is complete unveiling. Everyone should know whose doubles are whose and all will be well. Doubles should retain the same freedoms their users had before. The second opinion is maintaining doubles only within their own role plays and, if created, chat rooms. They should no longer be allowed to comment on the forum social topics such as Random Anything and Talk All You Want. Which opinion will win out in the end? None can tell, but the forums themselves. Vote here on which opinion you value. However, there has also been talk of giving double accounts name markers. Could that be the solution? No one knows for sure. Many of you may very well know Miss J’s history as a villainous double. 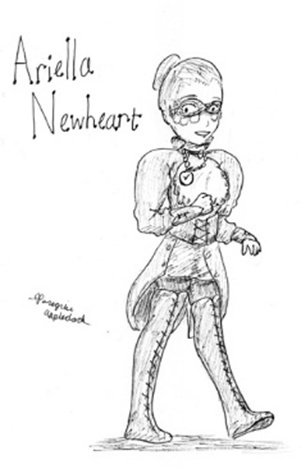 Created by Ariella Newheart, she was initially designed with good intentions, but began to grow darker. The outlook she had on life wasn’t something Ariella had hoped to create, and before long, Miss J had rejected the Scarlet man completely. Ariella realized she no longer wanted to be a part of Miss J’s story, which ultimately led to the reveal of her double. Alex Ironquill from the Aethasian Times interviewed Ariella, asking what she first had in mind with Miss J. What was your initial thought process when you decided to create @Miss_J? Miss J's account was created with the intention of using her to post on "Aislinn Mollisong, HERO", one of the oldest community role-plays. Other writers had used double accounts in the story before, and I wanted to try it out myself. I fully intended to reveal her identity a short time after creating her, but that didn't happen. When did you decide that writing @Miss_J wasn’t what you had intended? I'm not sure of the exact time, but definitely after I posted most of Miss J's journal segments. The story wasn't what I wanted to be known for writing and I became more reluctant to reveal who Darkfeather was. Was there something that caught you off-guard about her, @Ariella_Newheart? Yes. It was scary how well I could pull off Darkfeather's personality. At first I thought, Hey, this is great! No one will know it's me. But I had created her to be an unredeemable villain. My ability to write a character like that definitely caught me off-guard. Why did you first decide to write her as a villain? 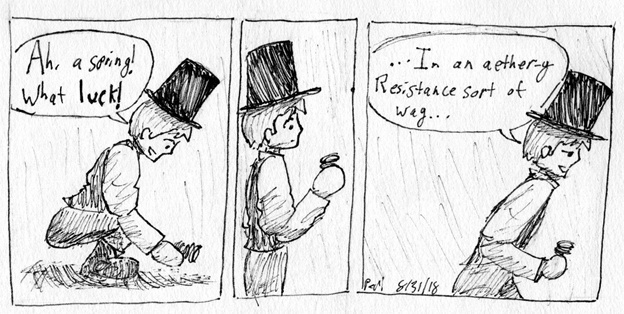 At the time we had a lot of role-plays about Resistance members and their backstories. No one had written much from an ex-Imperial villain's point of view. It seemed like a fresh, new perspective that would be intriguing for people to read. I also liked the idea of making an archenemy for Ariella Newheart's role-play character. Is there something small you think you could change about her that would make her storyline redeemable? I would have to make her more receptive to the message of the Scarlet Man. @Ariella_Newheart, did you use @Miss_J in topics aside from her roleplay? If so, did you portray her differently in other topics? 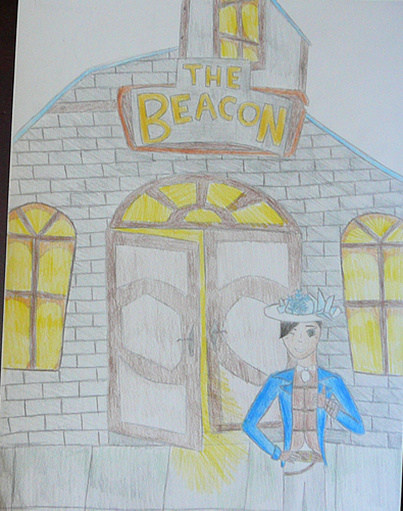 For the first five minutes of the meeting, Ariella, Miss K, Levi, and myself were in the basement of the beacon. Hanna Brassheart made a surprising appearance after being absent from the forums for quite a while. We talked about the forums as Christinao arrived and then Levi returned with Abriss. "Abriss left to craft something. We continued talking and then Levi had to leave. After that we discussed double accounts and Abriss came back. Christinao left and Hanna continued to tell us her ideas. Peregrine, Ak N. , and Lila joined us. Hanna and Miss K went to talk upstairs and Lila, Peri, and I chatted. "Miss Brassgear joined us but left shortly. Abriss then came back and Stanley arrived. As the time passed and the conversation shifted, we began wondering where everyone else was. Everyone started getting restless so we held a fashion show. "The theme was Animal. After several great entries the winner was..... Abriss! The next theme was Christmas. Ariella won that round. The next theme was fancy. Stanley won and the next theme was announced as superhero. The winner was Ariella. Random was picked as the next theme. "Peregrine won and I handed judgeship off to Abriss. The next theme was cotton candy. Peri won and everyone got ready for the next theme, Aviator. Lila won and Abriss left to do a quest. The fashion show ended and Ariella left. "The remainder of the meeting was filled with 'Guess the Person'. Stanley dressed as Xonos Darkgrate, I dressed as Jacoby Elderfun, Peregrine dressed as Pig Larkcape and Lila dressed as Azeline Darkheap. Lila left after the first round. For the second round Stanley dressed as Hans Oddcaft, I dressed as Goku Ironheart, and Peregrine dressed as Granville Darkgap. After that the meeting came to a close and Peregrine took a selfie before we all left." The results are finally in after a long week of waiting. See the poll here. President-elect Xaloy Dreadapple (Xaloy_Dreadapple) wins the election with 38% of the vote, 8-out-of-21. with a paltry 14% each. Dreadapple. Larkcape also then received the Members Vice President of the Month title. radical views on doubles and role-play ethics. Could this possibly affect the presidential run of the two? Does it also indicate a shift towards that perspective on the part of the voters? (the two Apple candidates). Hans Oddcraft, known political pundit of the forums, spoke out asking for someone to break the tie. Within a few hours, Jacoby Elderfun (Jacoby_Elderfun1) broke the tie just in time with a vote towards Xaloy. "And make sure Nola - er, Gracie - stays down here. If she really is Nola Applequill, I'm not sure how much I'd want to trust her." Nola A.:Case Unsolved is the exciting tale of Nola_Applequill1's detective career and journey of truth unfolding. Nola Applequill, a known criminal, left her grotto home to visit the office of Detective Gloria_Oldenpinner under an assumed name. After eavesdropping on a private meeting between the detective and Ariella_Newheart, Nola is arrested and interrogated by Scarlett_Darkhall, who questioned what Nola knew about a deadly group called the Legions. The excitement increases as the story continues. Nola's usage of other forum characters is remarkable, bringing the story to life with their personalities. Her style of writing is clear and well spaced, making the story very easy to read and understand. Although a twenty-six chapter story may seem daunting, Nola A.: Case Unsolved is a worthwhile read, keeping readers on the edge of their seats as they read each chapter. "I didn't know why I had such this strong curiosity, this passion to investigate... But I couldn't let that get in the way of doing my good deed of the millennium by actually helping detectives find a criminal and bring her to justice." Alex_Ironquill1 interviewed the authoress Nola_Applequill1, creator of Nola A.: Case Unsolved and Agent Lightspark: Revealed. 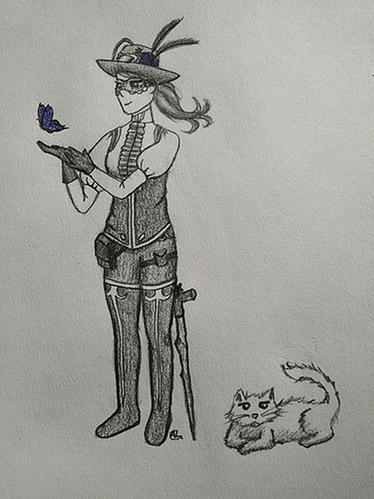 She is a regular visitor of the Aetherlight forums and very enthusiastic in the community. So, Nola. What’s your favorite part about writing Nola A.: Case Unsolved? Writing it! Writing is a passion for me, and I love writing different stories, but I'm going to have to say my favorite part is writing it out. ESPECIALLY in Nola's perspective. I don't know why, but I think her personality is kind of funny to an outgoing extrovert like me. But it's fun to write in a different language, if you will. What aspect of Nola’s personality do you find do be most intriguing/inspiring? Gooood question. Intriguing: Like I said, it's interesting to write in a different style. For example, there would be things that Nola would say that I wouldn't, just because our personalities are pretty different. But to me, it's intriguing to write, knowing where she came from and her backstory... Inspiring: Weeell... I can't really tell anyone that yet. All I can say is, "That would be telling". Ok, what first inspired you to write Nola A.: Case Unsolved? Well, writing is a passion for me and has been waaaaay before I joined the forums. 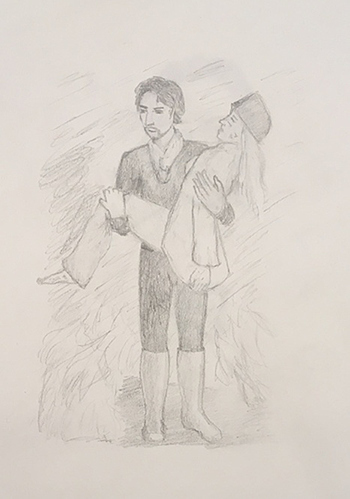 I've made backstories for my game characters and have been introduced to role playing way before I joined the forums as well, so when I saw we could role play here on the Aetherlight Forums, and I could write freely with a story about my character... Well... Safe to say I immediately jumped on that opportunity. Also, I can't really say much about this without revealing spoilers, but there is a story to be told and a lesson to be learned in this story. Stories aren't just about description, dramatic scenes, lovable characters and witty dialogue - those things are definitely vital - but it's also about telling something. Y'know, learning something. A lesson. And that's my biggest goal with Nola A.: Case Unsolved. That’s probably one of the best responses in the history of responses. But really, I think it’s awesome that you put so much character and truth into everything you write. In short, it’s incredible. Why do you individually value ‘teaching something’, and you put it? I value teaching because there is always something for us all to learn, and especially as Christians, we need to make sure we're constantly learning how to be better and what is right. And what's a great way to drive a lesson home, while the whole process is enjoyable and fun and amazing? A story, of course! Where readers can relate to the characters that are learning, so the readers can learn also. I value truth and what's right so much. I'm so thankful this is a Christian forum, so I can openly and freely give God the glory for every word that is written from that pen-- Er, keyboard. Do you have any specific plans for Nola that you’ve already begun to write? Great question! Absolutely. A story is simply not a story without a transformation - a transformation of not just the reader, but also of the main character. When Nola was younger, she grew up living a life of a nomad and, to be honest, not the best person. She lived off of what she could steal, and would occasionally lie to cover her identity or anything else she may need to hide. Although she would feel guilty about those things, her main goal in life was to just "survive". It's probably easy to see where I'm going with this, haha. I've already begun the transformation of Nola and her morals, especially by her sticking around the Resistance members that firmly believe in morals, the Scarlet Man, etc. As Nola gets more of a grip of what they believe, she starts to believe it as well. And that will eventually transform Nola. Cool! Do you plan on having a conclusion/end to your story, or are you going to try to keep it going as long as possible? I definitely have a conclusion/end in mind. If it's a free role play, I'd want to keep it going as long as possible, since there are pretty much endless possibilities when you've got tons of people writing with each other. But for a story role play like Nola A.: Case Unsolved, readers are going to eventually get tired of the story if there's no plot - no ending - in mind. So definitely, I do have a conclusion/ending sort of planned out. Although I won't give any spoilers, let's just say I hope it will be epic. Just suppose the wealthiest, kindest, most generous King in the history of anywhere built you a home. He filled it with everything you could ever possibly want or need, and you set it on fire. It wasn’t an accident, but an act of rebellion against the monarch who had done so much for you. To top it all off, you didn’t even call the fire department. You lay unconscious in the burning building, breathing in the thick smoke, burning to death in the flames of your rebellion. While you lay burning, the King called the fire department to battle the flames. He also went a step further. The Ruler, (who had every right to have you executed) donned a firefighter’s equipment and went into the blaze to save you. He found you half-burned and barely alive. He gave you His mask and coat to protect you from the smoke and flames. This, of course, meant that He would get burned by the fire. He would breathe the smoke so you wouldn’t have to. He strapped you into a harness, and a helicopter lifted you out of the flames. Just after this, the burning house collapsed with Him inside. There was no possible way out. The King who loved you so much perished in the flames. However, it didn’t stay that way. He walked out of the ashes alive and well. It was nothing short of a wondrous miracle. His strong arms caught you as you were lowered by the helicopter. He whisked you away to a hospital were your injuries could be treated. It was there that you opened your eyes and met your Savior. He told you that after you left the hospital, He would take you to the royal palace to live with Him. Until then you would have to go through various skin grafts and procedures to clear the effects of the smoke from your lungs. However, you wouldn’t have to worry. He would be right there holding your hand through it all. The procedures might get a little intense, but He would never let go of your hand. You were His now. There was nothing in the past, present, or future that could ever separate you from Him. It gets even better. One day, the King is going to build you another house even more wonderful than the one you destroyed. He would build it right next to the royal palace so you could see Him whenever you wanted. He would be yours and you would be all His. You would both live happily ever after forever and ever. A recent movement has caused several old topics to be rediscovered by the forumers. Topics such as You, as a cat, Compliments, and Bible Triva, Facts, and More. Missy_Vonheart is the forumer who revived the Bible trivia topic and compliments topic. She's a frequent visitor of the forums and owner of the Heart shaped Pastry Shop. Many of the old topics recently revived are brand new to the greener of us, and there could be more ghost town gold mines yet to be rediscovered! Who knows what topic will be brought back into view?